The thyroid is a gland located in the neck region of humans and dogs. It lies in the area behind the trachea near the Adam’s apple. The function of the gland is to release hormones called thyroxine (T4) and triodothyrine (T3) directly into the system that regulates how the body uses energy (metabolic rate) and how the body responds to other hormones. It also produces calcitonin that helps control calcium levels. The thyroid gland is under the control of the Pituitary gland often referred to as the master gland. Thyroid disorders are more common in middle aged and older dogs. As with most organs the most common problems with the thyroid in dogs are either too much activity (hyperthyroidism) which is more common in cats than in dogs, or not enough activity (hypothyroidism) which is more common in dogs. Less commonly, as with people, animals can develop cancer of the thyroid gland. Fortunately this is uncommon in dogs. The most common signs of hypothyroidism in dogs are skin disease, weight gain, inactivity and intolerance to cold temperatures. The hair may become thin with excess shedding. The skin may be dry and flakey and there may be a tendency toward bacterial skin infections. While not all dogs are affected by hypothyroidism in the exact same way, most will have some of these signs--which can be slowly progressive and go unnoticed. 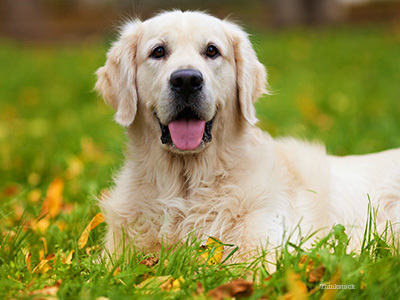 While hypothyroidism can occur in any breed it is most common in medium to large breeds and in Golden Retrievers, Doberman Pinchers, and Irish Setters. In the past it was common to treat thyroid problems based on thyroid symptoms only; unfortunately, a lot of people and dogs were treated for hypothyroidism when in fact they may have had other problems that merely interfered with the thyroid. Human and animal hormones are different and occur at much different levels so tests developed for people are generally inaccurate. Fortunately, today we have a number of tests for pets to evaluate thyroid function. These tests are simple blood tests to measure thyroid produced hormones (T3, T4, free T4 and thyroid stimulating hormone or TSH). All have been developed specifically for dogs and cats and have really helped veterinarians diagnose thyroid problems. Most thyroid problems in dogs are associated with low levels and so a simple supplementation or addition of thyroid hormones will result in normal levels quickly. Response is generally dramatic. Unfortunately, there is no cure for hypothyroidism and supplementation must be given for life. Hyperthyroidism is uncommon in dogs but may occur with active thyroid cancer. Surgical removal of thyroid tumors is possible but radiation therapy is more likely to be effective. Should my dog be tested for thyroid problems? Unfortunately hypothyroidism is slow developing and can be confused with a number of other conditions. It has been called “the great imposter” and a correct diagnosis is important. Obtaining your pet’s base levels with routine blood testing is often advised in all middle aged and older dogs. After that, any low levels may require further testing. I recommend that you routinely evaluate thyroid function for any dog over 5-7 years of age.